If you’re a big fan of The Elder Scrolls Online, this art print is for you. Indulge in a map of the beautiful Tamriel which is from the famous Elder Scrolls Online. It has so much history in-game and is made up of several continents you can explore. This limited-edition map shows the true size and beauty of this mystical and legendary area. Pre-order yours today to not miss out on this incredibly rare item! 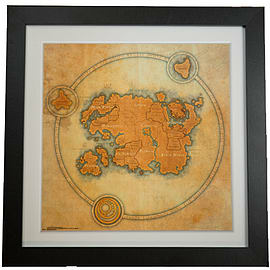 Admire the legendary map of Tamriel from The Elder Scrolls Online with this beautiful art print. This is the perfect purchase for any fan or collector of this game and the map displays the mythical area in incredible detail. There are only 2000 available of these limited-edition maps of Tamriel that have been produced, exclusively for GAME, and you will also receive a certificate of authenticity.